(Available only for HTML, RSS Pro and RSS Pro Details pages). - images used by default. You can use your own images (optional). 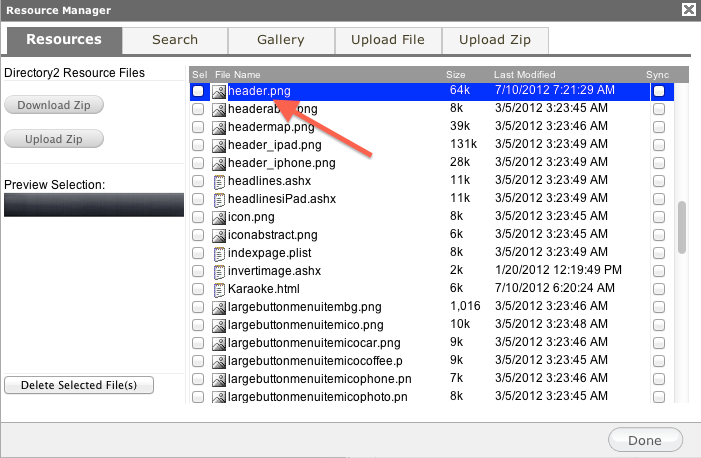 Upload them to app resources using Resource Manager. 3. Edit RSS Pro page. 3.1. 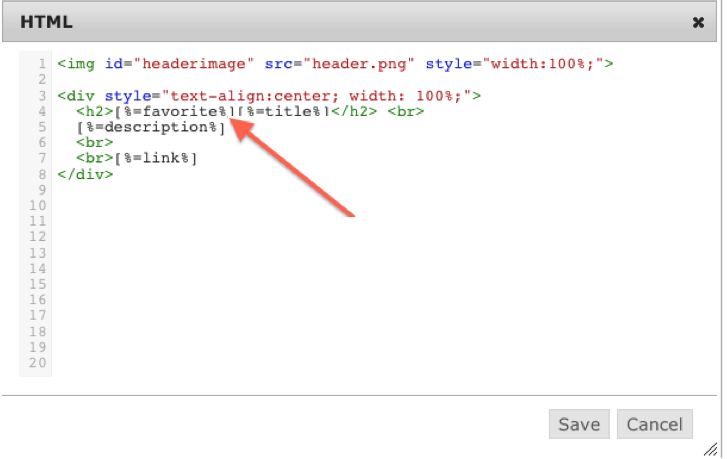 Edit Rss Pro page in HTML mode. 3.2. 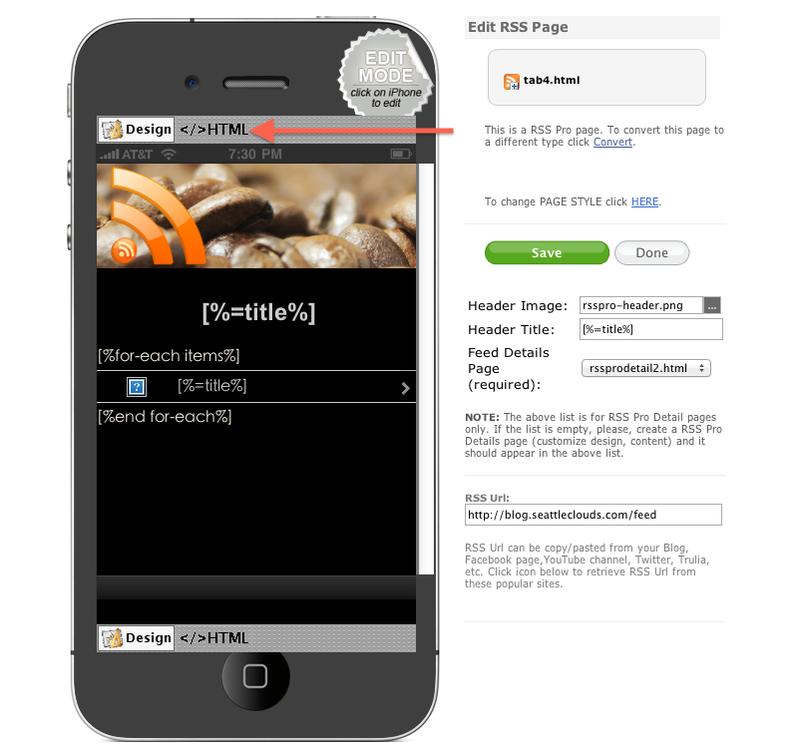 Add [%=favorite%] tag into RSS Pro page. In this place will appear favorite.png or favoriteoff.png. 4. Now you can bookmark articles from RSS feed. Tap on "favoriteoff.png" to add article to Favorites page, or "favorite.png" to remove it. Swipe right to left to remove an item from "Favorites" page. Now you can add the favorites button. You'll be able to add the Favorites Button to any of your pages. 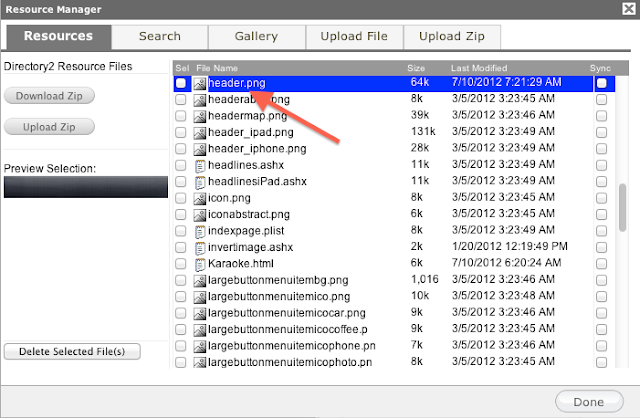 It can be found in Design Toolbox. 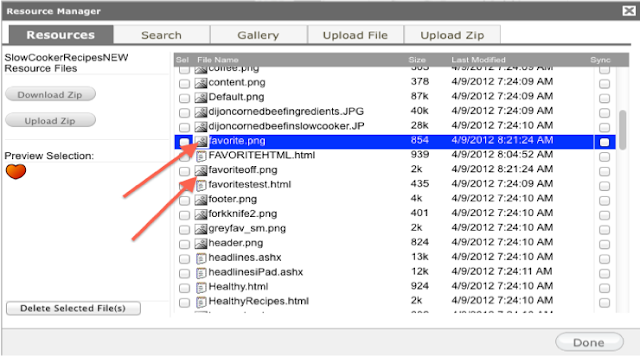 In the opened window you will have to select the HTML page you want to have the Favorites option and provide a title. Once the button is added user if clicks on it saves the current page to favorites. In Favorites feature if user clicks on a saved page he'll be redirected to it. If you will have any related difficulties consider to open a support ticket. Use SeattleClouds Previewer app to test this feature. Is it possible to use favorites for html pages? This is a great question, if Jennifer is referring to the HTML page and Mobile page types. I would also like to know if it's possible to use favorites for the HTML page type. We are working on this feature, and it will be available soon. Like many other PAGE features, if this also can be enabled disabled for any page under 'PAGE SETTINGS' that will be great. I'm excited to see this feature for HTML pages as it will be a valuable part of my app. It would be great if the user could select some text on a page and bookmark that text, or bookmark the whole page. When does SC expect to make this feature available for HTML pages? I think this feature will be available this Monday (29 Oct). How will we know when it's live. I'm looking forward to this. Thanks! Now you can add HTML pages into your favorite list. Thanks SC for listening and for this great update! Is there any chance that this will be added as a feature in the "Page Settings" so it can be enabled/disabled for pages with a simple checkbox? (Like Ivan mentioned above). Then the "favorite" icon could be in the Navigation Bar on the top right instead of buried in a page disrupting the text of the page. If so, it would also be great if we could select the image for the "favorite" icon like we can now (or if not, my vote would be to use a star instead of a heart). Great that the favorites is available for html pages now. Is there a tutorial for how it all works? Hi Teemu, I will update this tutorial soon. Have added favorites to html page, but when I look at favourites page it lists the favourites list page and when I choose the app closes! Any idea why this is happening? Could you update tutorial to include dynamic data as well, as when i turn feature on app reports unkown URL when linking to favorites.html page. Got it working on iPhone but on nexus 7 android when going to favourites page it says 'incorrect URL' has anybody any ideas why? I am having issues when clicking the heart its says 'the address wasn't understood." Did you do something specific to get it working on the iPhone? will the favorites page work offline? So RSS stories marked as favourites can be accessed without internet connection? Revisiting this thread, I would like to know where the Favorites for HTML page tutorial is? Eugene added that to the thread on Nov 2, 2012 (about 6 comments back). Is it possible to customize the single favorite page? I mean you have the favorites list view and you choose a single item.I want to customize the single page displaying the item info. anyway to edit a favourites icon with the edit pop up window? Seems like I have to delete the favourites icon just so that I can edit the title, resize icon etc..